With Sn0wbreeze 1.8 for Windows, you can now create custom firmware files of iOS 4.1 Beta for iPod touches which are already jailbroken on iOS 4.x. Currently, only iPhone 3GS (old bootrom pwned on iOS 4.x, and new bootrom pwned on 3.1.2 or with 3.1.2 SHSH blobs), iPod touch 2G (non-MC model, and already jailbroken on iOS 4.x), and iPod touch 3G and 2G (MC model) pwned on 3.1.2 or with 3.1.2 SHSH blobs are supported. 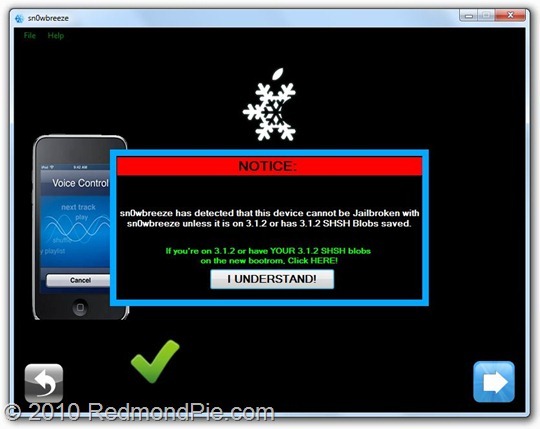 So if you qualify any of these requirements, then you are good to go for a iOS 4.1 Beta jailbreak with sn0wbreeze 1.8. iPhone 3G users will have to jailbreak using Redsn0w, guide for which is posted here. The instructions for jailbreaking with Sn0wbreeze 1.8 as usual are exactly similar to the instructions we posted earlier for iPhone 3GS. Simply download iOS 4.1 Beta for your version of iPod touch, and then follow the complete step by step instructions posted here which will guide you on how to create custom firmware files. Once you have created a custom firmware file, you can simply restore to it via iTunes 9.2 to complete the jailbreak process. Is there any jailbreak for iphone 3GS iOS 4.1? SOMEONE PLEASE UNLOCK THE IPHONE 4…. forget the 3G/2G… iphone 4 is what we need.. come on guuuuuys!!!!! Appreciate ALLL the work guys!!!! !TOP NOTCH WORK.. done by TOP NOTCH PEOPLE!! is this a joke? “create custom firmware files of iOS 4.1 Beta for iPod touches which are already jailbroken on iOS 4.x. ” there is NO jailbreak for ipod touches on ios4.x – thats the problem! I just want to JB my ipod touch 3g !!!!! amm if i dont had the shsh archive? i can do it the jail or not? my ipod is a 3g 32 gb.. i hope you can help me. sorry my english is not the better..
Can I do this into my Ipod 3G (MC model) jailbroken 3.1.3 with Spirit? I bought a new ipod touch 32GB a few weeks ago with OS version 3.1.3. I jailbroke it immediately with Spirit and backed up my SHSH blobs to Saurik's server. Am i eligible at all to upgrade to a jailbreakable version of OS4? i don't have the SHSH blobs. they are backed up on Saurik's server and i think the SHSH blobs are unique to each device so i dont think it will work on your ipod. I have a 64gb ipod touch 3g running ios 4.1… is there a jailbreak for this yet?